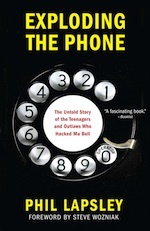 I'm delighted to announce that my book on the history of phone phreaking, Exploding The Phone: The Untold Story of the Teens and Outlaws Who Hacked Ma Bell, will be published this February by Grove/Atlantic. It will be available in both hardback and ebook form at that time. The official web site is at http://explodingthephone.com. Pre-order it from either Amazon, Barnes & Noble or Books-A-Million, or ask your local bookseller (maybe via Indiebound) to pre-order it for you. Spread the word however you like – like us on Facebook, follow us on Twitter, post something about the book on your blog, or talk it up the old fashioned way, face to face over coffee or a beer. I will be doing a nationwide book tour in February and will update this blog and the web site when I have dates and places. Thank you for your continued interest and support. It has been quite a journey to get to this point. I can't wait until the blasted thing is actually published and you all get to read it!